Died peacefully on Monday, March 20, 2017. Born in New York City, NY she grew up in Washington, DC, where she attended the Potomac and Madeira schools. She graduated from Smith College in 1948. Two years later she married George Burgwin Holmes who had a career in the Central Intelligence Agency (CIA). She was a lover of, and expert in, antiques, and ran an estate sale business for many years. She was widely known for her ability to spot the $100 rarity in the $1.00 bin. 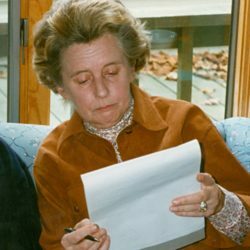 Her other passions included singing, travel, reading, and everything literary, including the Washington Post and New York Times crosswords every day, the New Yorker, a novel a week, and five other magazines every month. While at Smith she sang with the Smiffenpoofs, an all-female a cappella singing group, and in Washington with the Clef Dwellers. In 1950, she was instrumental in the founding of the Augmented 8, an all-male a cappella singing group that continues to thrive to this day. As an Agency spouse she moved her family, sometimes on short notice, to and from Brussels, Sweden, Cameroon, London and Malta. In later years she and George travelled extensively. At Ingleside, her retirement community, she chaired the Decorating Committee, bringing her extensive knowledge of design and color, cultivated during her lifetime interests and worldwide travels. She is survived by her children, Brock Holmes of Silver Spring, MD, Kate Holmes Caldwell of Severna Park, MD and Sarah Holmes Morris of Bethesda, MD; as well as grandchildren, Alexandra, David, Meredith and Rose. Her husband died in 2012. A memorial service w held on Tuesday, April 18 at 11 a.m. in the Bethlehem Chapel at the Washington National Cathedral, 3101 Wisconsin Avenue, Washington, DC 20016. In lieu of flowers, memorial contributions may be made to the Washington National Cathedral at above address, or Doctors Without Borders, 333 7th Avenue, New York, NY 10001.